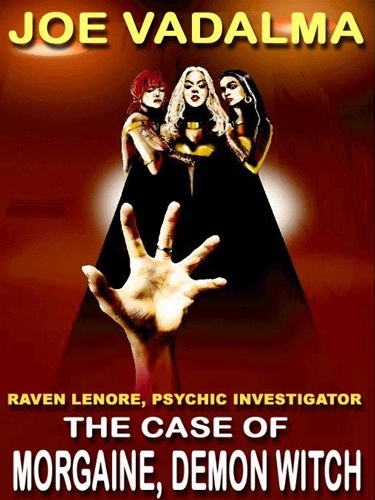 At last, the long-awaited confrontation between Joe Vadalma's greatest creations: psychic investigator, Raven Lenore, and the powerful, treacherous Morgaine, the witch. Fans of both series will thrill to this ultimate adventure of Raven and Morgaine. The is the novel they've been waiting for! Raven Lenore must use all her wit and street smarts to defeat the demon-witch Morgaine. Many of the characters from both series are present, such as Henry Bagyar the beast; Annie B.; Michael Ellul the thousand-year-old sorcerer; Lara Borinski (Michael's second wife); Mephistopheles the magic cat; Peter Magbertius (Raven's nemesis); Lenore Raven (Raven's doppleganger)—as well as an assortment of demons, ghosts, vampires and angels, and new characters, in a heady brew of evil against good—and evil against evil, as demonic cults vie for power. Only Raven can save the world from the horrors from the abyss!